Welcome home!! Family entertainment abounds with multiple living spaces including a great room, living room, and a HUGE loft waiting for all your fun games and toys! Filled with upgrades, including granite kitchen counters, tall, dark and gorgeous staggered cherry cabinets, upgraded GE Profile stainless steel appliances, a huge island with breakfast bar, ceiling fans in every room and tile throughout the ground floor including wood look plank tile in the great room & office. 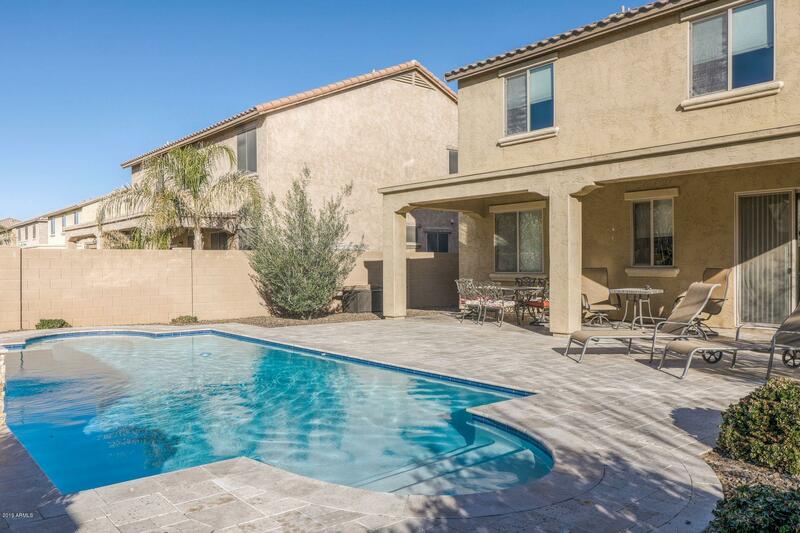 The backyard oasis features a pristine HEATED POOL, huge covered patio with travertine tile throughout; AND with the north facing front the backyard is the perfect place to entertain and just hang out all year round! The master suite is extra spacious and the master bath is equipped with double sinks, two walk in closets, a walk in shower & separate garden tub! The huge upstairs guest bedrooms both have walk in closets and the downstairs bedroom/den/office is super convenient and has its own full bath! The family room, Loft and patio are all equipped with surround sound for a whole house experience. The community of Bella Via has lots of parks, playgrounds and walking paths and is just two miles from freeway access and lots of shopping options. This home really Is a find. Don't wait. Come see it today.